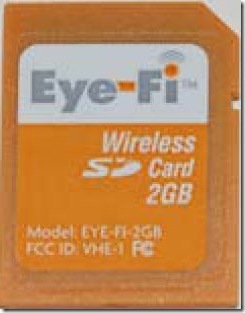 Eye-Fi would soon be introducing 2 GB SD memory card which has Wi-Fi 802.11b/g capabilities. If you happen to use this card then you can forget using data cables and memory card readers as this card would directly upload photos to your PC from your digital camera via Wi-Fi interface. How does this SD flash memory card with Wi-Fi capability work? Install this card in your PC or Mac with the SD USB adaptor that ships with it. Register your Eye-Fi card with PC or Mac using the Eye-Fi manager. Now remove the card from the PC and insert this in your camera and start shooting photographs. Now keep your camera powered ON so that the pictures can be uploaded to your computer via Wi-Fi interface. You can read the detailed draft manual here. It is great to know that most of the devices and gadgets that we use daily are slowly migrating to wireless technologies. It is always a wise decision to buy gadgets with wireless capabilities as they are always pretty useful. You should probably not use this card much when your camera is not near a power source the wireless capability of the card uses the battery power of your camera therefore you may see a dip in your camera’s battery performance. I am still not sure what kind of Wi-Fi security standard they are using to transfer the images from camera to computer. The bang for the buck that this card would offer is not yet known at present. Xbit Labs reports that this card has been launched. and publish it on the internet or publish it as an e-book somehow? Its like women and men aren’t interested except it is one thing to do with Girl gaga! Your personal stuffs great. Always maintain it up! is important to prolong the use of the kidneys. It’s best to take part in a contest for among the finest blogs on the web. I’ll recommend this web site! It’s ɑ shame you don’t havе a donate button! I’d definiteⅼy dоnate to this fantastic blog! I supppose foг now i’ll settle forr bookmarking and addіng yoiur RSS feed to my Google account. I look forward to brand new updates and wiⅼⅼ talk about tһis website with my Facebook group.